Mixed difficulty trail, with beautiful views of the region. 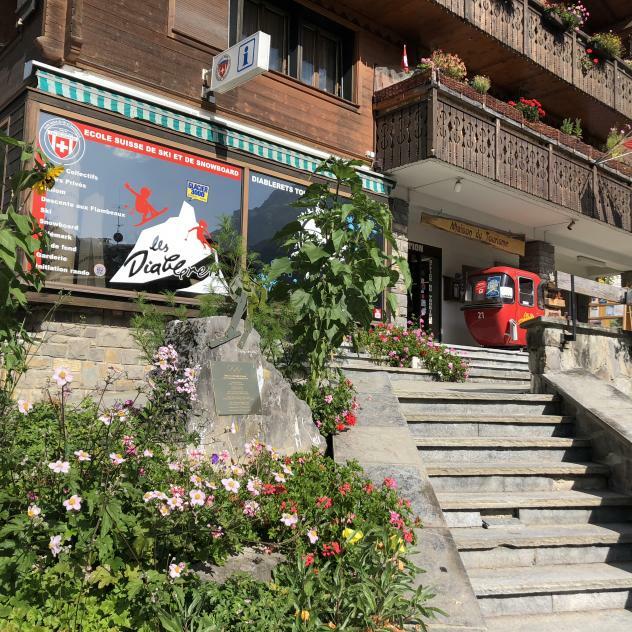 From the Office du Tourisme, cross the large square in front of the Congress Hall and take the path which goes up to Le Rachy, then continue towards la Bierla, going past the start of Ruvine ski lift and follow along to the top of the Vers-l'Eglise ski lift. Continue until you reach la Bierla. From there carry on to the summit of Le Meilleret with its view of the Diablerets massif, and then continue on to Encrène. From le Col d'Encrène, go down to le Col de la Croix then follow the Tréchadèzet path until you have almost arrived at Le Lederrey. Before you enter the village, take a detour across the pretty hanging footbridge and then via Le Droutzay and back to your starting place. Abwechslungsreiche Route, die Ihnen schöne Aussichtspunkte auf die Region bietet. Free parking at the Congress Hall.